MONROVIA – A 6-month-old infant was taken from the arms of her mother Monday afternoon by a Great Dane and carried 200 feet before the dog let go, authorities said. The child was flown to the Los Angeles County USC Medical Center to be treated for bite injuries to the chest, police said. The child was was reportedly experiencing possible complications Tuesday, but had been in stable condition Monday, officials said. The mother was visiting her neighbor in the 600 block of Laurel Lane at 2:24 p.m. when the 3-year-old, 170-pound, Great Dane took the child, police said. Adults chased the dog which carried the infant for 200 feet, Monrovia police Lt. Michael Lee said. The dog dropped the child and ran home, police said. Monrovia paramedics treated the child before the infant was flown to the hospital, Lee said. The dog has been quarantined, where it will remain for ten days during an investigation, the lieutenant said. Monrovia police say there is no record of aggressive behavior from the dog prior to the attack. BURBANK – More than two years after 16-year-old Sammantha Salas was gunned during a string of racially charged gang shootings in Monrovia, jury selection began Wednesday in the trial of two men charged with her murder. “Well, it’s finally happening,” said Janette Chavez, Salas’ mother. The teenager was shot to death by two masked gunman in January 2008 as part of what investigators believe was a string of retaliatory shootings between a black and Latino gangs in Monrovia. Two cousins, 28-year-old Nickelis Blackwell and 24-year-old Rayshawn Blackwell, are accused of shooting Salas to death as she was walking with a friend near her father’s home in unincorporated Monrovia. Chavez spent Monday waiting for a jury to be picked, and she said that based on the evidence she heard in the preliminary hearing, she hopes that jury convicts both Blackwells of murder. “I want them in prison for the rest of their lives so another family doesn’t have to suffer the loss that we did,” Chavez said. The trial was moved to Burbank last week because no courtrooms in Pasadena were prepared to handle a case that attorneys believe could last three weeks, prosecutors said. A witness in the preliminary hearing for the Blackwells said the cousins confessed to the crime the night of the shooting. several proposals, including fines for residents who don’t secure their trash, will be presented to the council during its regular meeting tomorrow. LOS ANGELES – After a brief hearing, Superior Court Judge David Jaffe today granted an injunction filed in October by the city of Monrovia and Los Angeles County aimed at limiting gang activity in the area. The judge denied a request by three alleged members of the Duroc Crips gang who appeared in court and asked to be excluded from the injunction, which also names the Monrovia Nuevo Varrio gang. The gangs have battled for years, and gang violence led to four deaths in in late 2007 and early 2008. Deputy District Attorney Deanne Castorena, who has worked on several gang injunctions in L.A. County, said after the hearing that the injunction would dramatially help curb gang activity in the region. Coroner’s officials identified Jason Samuel Gentile, 22, of Costa Mesa, as the man who was shot to death in Monrovia Tuesday night. Rumors Tuesday night that a third shooting had occurred at Julian Fisher Park were unfounded. No such shooting took place. Rumors Wednesday that the homocide victim was Garrett Jones, a Monrovia High School graduate, are untrue. The victim’s name has not been released by police at the time of this posting, but he was not Garrett Jones and did notattend Monrovia schools. MONROVIA – A man was killed and a woman injured in a shooting Tuesday night. Map of 2009 San Gabriel Valley and Whittier-area homicides. Sheriff’s Det. Brian Schoonmaker said a pedestrian was shot by a man who was also on foot. The wounded man died at the scene. He said a woman was also wounded and taken to a hospital. He didn’t know her condition. Sheriff’s homicide detectives were assisting Monrovia Police with the investigation. The killing is the third in Monrovia this year, and the 93rd in the region. Jeanette Chavez has become a force for good in the community after the brutal slaying of her daughter Sammantha Salas in 2008. Not only has she reached out to other surviving family members of homicide victims, Chavez’s work was instrumental in getting Crimestoppers in Los Angeles County off the ground. Chavez helped create the Los Angeles County branch and hopes it encourages people to come forward with information on unsolved crimes. 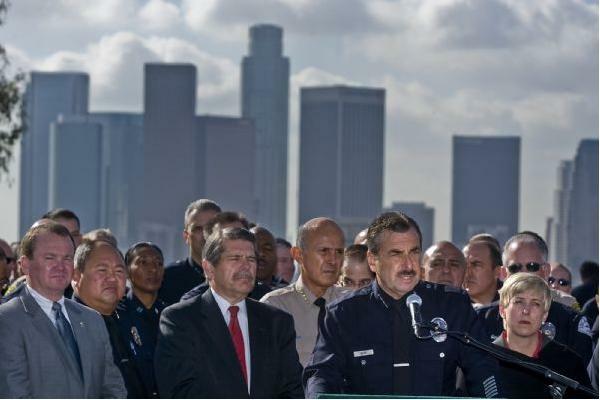 Sheriff Lee Baca and newly anointed Los Angeles Police Chief Charlie Beck both praised Crime Stoppers, saying the program has proven effective wherever it’s been implemented. “Over a half-million crimes have been solved because people were willing to pick up the phone,” Baca said. The program began in Albuquerque in 1976 and has since spread to communities across the country, paying out more than $75 million in rewards, according Mark Speer, executive director of Crime Stoppers. Tips can be called in, texted or e-mailed to Crime Stoppers, and the information is encrypted to keep the identities of tipsters secret. Cash rewards of up to $1,000 are paid for information on crimes ranging “from vandalism to murder to terrorism,” said Speer. The program does not cost the county anything because the rewards are funded by donations, he added. Speer said Chavez’s help in organizing and soliciting donations was instrumental to Crime Stoppers getting off the ground in Los Angeles. “She’s certainly taken a very proactive stance and feels that the best way to honor her child is to help other families stop violent crime,” he said. Police agencies from 25 different cities in the county are participating in the program, Baldwin Park, Covina, El Monte, Monrovia, South Pasadena and Whittier. MONROVIA – Prosecutors have targeted two violent street gangs blamed for several racially motivated shootings and slayings over the past three years as part of a proposed gang injunction, according to court documents obtained Tuesday. In all 17 suspected members of the mostly Latino Monrovia Nuevo Varrio gang and 21 suspected members of the mostly black Duroc Crips are singled out in the documents. The injunction is being sought by both the Monrovia City Attorney’s Office and the Los Angeles County District Attorney. naming several gang members and listing some of the activities they are suspected of being involved with. A model who was found dead inside her Monrovia apartment in September died of asphyxiation, the Coroner’s department said on Tuesday. The woman’s cause of death was determined on Friday after toxicology reports were completed, Los Angeles County Coroner Assistant Chief Ed Winter said. Tests found traces of cocaine and GHB in Lee’s body. Lee’s boyfriend, Brain Randone, has been charged with torturing and killing Lee inside the couple’s Monrovia apartment on Sept. 11. The 31-year-old Lee starred in adult movies and modeled under the name Felicia Tang. Randone, 45, holds a bachelor’s degree from Moody Bible Institute in Chicago and appeared on the 2000 Fox reality show “The Sexiest Bachelor in America.